We're "home on the range" surrounded by beautiful mountains, a lake, and grain fields. Jeredene is a former music educator and a performance musician. After an amazing career with Northern Rockies Educational Services, Inc, where she was an Associate, Grant Writer, and Technology trainer, Jere is now the Technology Coordinator for Cut Bank School District #15. She is also an award winning cook. Checkout her recipe page. She's Falling Water Woman to a lot of people and helped start the area's multi-community, interdenominational choral group - A.N.G.E.L.S. (A North-central Gathering of Ecumenical Liturgical Singers). Interested in web site design or administration? Call her MTunz (pronounced Montana-tunes) and find her at MRTC. Jack is an award winning copy writer and operates Positive Images, a consulting and Public Relations firm for north central Montana. Ask about half the buckskinners in the country and he's Lame Bear, that feller that runs Medicine River Trading Company. He also is a world authority on the life and times of Toussaint Charbonneau. Our family is additionally extended by Jack's two grown sons. Matthew (and his life love, Katie with Lily and Max) and Mark. SEVEN grandkids!!!!! Loving this Grama and Grampa gig!!!! Oh yes, don't forget the animals - a couple of dogs and some cats! You can see pictures on our picture page (link below). We're a Christian family that has been blessed with living at the foot of the greatest mountains in the world - East Front of the Rocky Mountains. Our back porch faces the Bob Marshall and Scapegoat Wilderness areas and in between is Lake Frances. A fair fishing lake if you like walleye, Northern pike or lake trout! 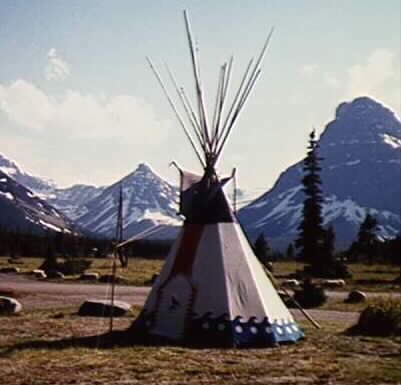 We are 45 minutes from Glacier National Park, the "Crown Jewel" of the National Park system. Here are a few pictures to give you some idea of what makes up this special family and what we do...and where we live. Drop us a line if you'd like to know more. This site designed by MTunz.